Both the men's and women's swimming and diving teams celebrate their New Jersey Athletic Conference titles two weeks ago. Photo courtesy of Sports Information. Twelve – a number that can be seen as one of the most iconic in the sports world. Tom Brady, Aaron Rodgers, John Stockton, The “12th Man” in Seattle. You get the point. 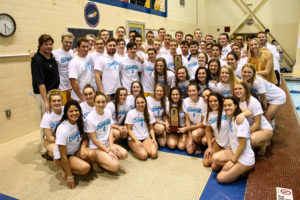 But, for the Rowan women’s swimming and diving team, 12 was the amount of points between them and a first place finish last season in the Metropolitan Championships. 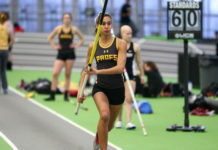 In the meet a year ago, the Profs came in second with 1,086 points in the three-day meet held at Rutgers University, just a dozen points away from the 1,098 that the University of Bridgeport secured for the gold. Then-freshman Carlee Timmins set a school record in the 1650 freestyle with a time of 17:36.77, good enough for a third place finish. Timmins broke that record this year in the WPI Gompei Invitational in the first week of December with a time of 17:24.43. The team had top-five finishes in seven events, including Timmins’ record-breaking freestyle. But this is a different team ready to take things to the next level, and head coach Brad Bowser worked all season to do just that. When it comes to the meet itself, Bowser isn’t looking for individual success. Instead, it’s what sports are all about: the team. 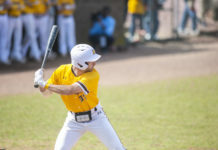 On the men’s side of things, the Profs are coming into the Metropolitan Championships aiming to secure the trifecta, winning their third year in a row. The team took gold in five events. The team looked much different then than it does now. There is no Jesse Novak, Nick Marks, Mike Simunek or John Morris. Freshman Youssef Elshenawy was named New Jersey Athletic Conference (NJAC) Men’s Swimming & Diving Rookie of the Week three times this year. Freshmen Oliver Cruz and Dylan Regan found success in the 200 medley and Kevin Gillooly in the 400 freestyle. When asked if both teams finishing first is a possibility, Bowser kept it simple.